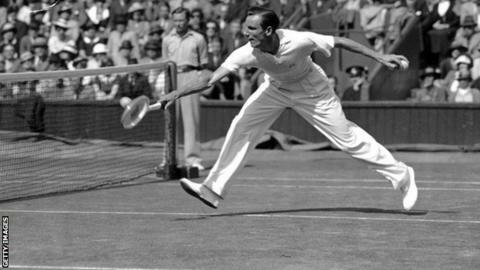 From Fred Perry to Andy Murray, British tennis has been on a long journey in the 76 years it has waited for another male Grand Slam singles champion. Murray's victory at the US Open on Monday came on the same date as Perry's last major win in the United States on 10 September, 1936. Style and play have changed dramatically in the years since Perry, competing in white linen short-sleeved shirt, cotton trousers and plimsolls, triumphed with a wooden racquet. "They were completely different times. The wooden racquets they used were a lot heavier," says Jon Henderson, author of the Perry biography 'The Last Champion'. "You could hit occasional big serves with the old racquets but today's graphite ones are very light, strong and flexible, and you can get the consistency. "The serve in Perry's time was considered more as the way of starting a rally rather than a big offensive shot. "Some of the rules of tennis have changed. You weren't allowed to be airborne on serves when you hit the ball back then. You had to keep your feet on the ground. "It was more of a chess game than a power game in those days." Perry was the first player to win all four Grand Slam titles - French, US, Australian and Wimbledon. He won a total of eight majors, including Wimbledon three years in succession. The Stockport-born player, the son of a cotton spinner, emerged in an era when tennis was dominated by former public schoolboys. His family moved to London at the age of nine when his father became national secretary of the Co-Operative Party and the young Fred played tennis on public courts near his home on a housing estate in Ealing, west London. Perry's humble background helped make him a popular figure with the Wimbledon crowds, although he often resorted to gamesmanship to unnerve opponents. In his second Wimbledon final, against German Gottfried Von Cramm, Perry pulled the lining of his trouser pocket out. "He knew it would upset Von Cramm because it would offend his liking for neatness and tidiness," said Henderson. "In a doubles match in America, an opponent once threatened to punch him on the nose." He also managed to be a world table tennis champion in a colourful life that saw the pipe smoker date some of the world's most beautiful women, including Marlene Dietrich and Jean Harlow, and have four wives. Perry eventually tired of the British establishment and moved to America, where he took up citizenship and served with the US Air Force during the Second World War. "Murray has effectively been a one-woman man [Kim Sears is his girlfriend of seven years], whereas Perry's four wives were just the tip of an iceberg. He had amazing charisma and dated an A-list of Hollywood actresses," said Henderson. But Perry's final marriage to Barbara Riese in 1952 lasted more than 40 years until his death aged 85 in Australia in 1995. There are similarities between Perry and Murray, who at one stage in his career was sponsored by the famous clothing brand which bore Perry's name. "Perry took fitness seriously in a similar way to Murray, and used to train with Arsenal FC," said Henderson, a former Observer newspaper tennis correspondent. "They are both supremely talented, natural tennis players, and in that respect out of the same kind of mould." Before Murray at last triumphed in a major, Brits had endured a series of near-misses. Roger Taylor reached the last four at Wimbledon three times and at the 1970 Australian Open, but never progressed to a Grand Slam final. John Lloyd, now a BBC pundit, was runner-up in the 1977 Australian Open while Canadian-born Greg Rusedski lost out in the US Open final 20 years later. And Tim Henman reached six major semi-finals between 1998 and 2004, a run which included four appearances in the last four at Wimbledon. Virginia Wade was the last British tennis player before Murray to claim a major. She won Wimbledon in 1977, the Queen's Silver Jubilee year, while Murray triumphed in the year of the monarch's Diamond Jubilee celebrations. With the 25-year-old Scot tipped for more success, he can lay claim to be the greatest British tennis player since the war. "He's definitely the best since Perry. He could go on to win another few Grand Slams," said Henderson. Read more on Who was Fred Perry?